The conversation continued until the whole class and even the teacher go involved, ultimately with everyone asking where they could get a pair. The idea of not only having a quality product and a positive movement behind the brand exploded the company into instant success, mostly because of word-of-mouth marketing about their one-for-one program. According to data provided by TOMS, they have given over 10 million pairs of shoes to children since 2006. TOMS doesn’t only sell shoes anymore, they now sell shoes, giving a new pair of shoes to a child in need, eyewear, giving the gift of sight to a person in need, and just recently coffee, giving a week of clean water to a person in need. Do you see the pattern here? Blake Mycoskie, Founder and “Chief Shoe Giver “ of TOMS, came up with the one-for-one idea back in 2006 while traveling in Argentina when he noticed the shocking amount of children growing up without shoes. Instead of creating another donation company he came up with the idea that now embodies TOMS as a whole. Mycoskie could’ve tried to set TOMS up as another nonprofit organization that take donates for children shoes only but he understood the power of putting a purpose behind the purchase. Non-retail organizations (i.e. musicians) have been doing this for a while—putting on live concerts or even selling exclusive albums that have a certain percentage of the profit going towards a cause. It’s more of a trade of goods for charity. It doesn’t matter how great your product or service is, your target market shouldn’t be everyone. You should have your market broken down into four personas. These four personas should have separate strategies to acquire them as a customer. Customer acquisition works 100x better when it’s specific, personal, and it solves a problem that persona has or cares about. Over time you should gain more personas and developing new strategies to acquire customers. Recently Mycoskie did a short interview with entrepreneur title TOMS Founder: ‘Focus on Your Passion. Nothing Else Matters.’In this article, he answers a few simple questions about the knowledge he has gained from TOMS and the last questions his advice for aspiring entrepreneurs is, “Focus on your passion. Nothing else matters.” Passion is important because it keeps you going. If you’re not passionate about your business it’s going to reflect in how you run your business, and your business will likely fail. 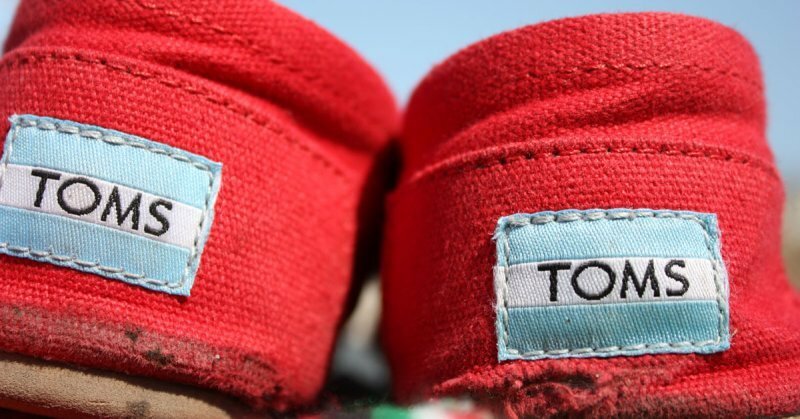 TOMS has only been around for 8 years but it has grown into a global brand. You have to start somewhere and what better way to start than by coming up with an original business model that is focused on its customers and you’re passionate about it. Mike Alder is a University of Utah business marketing student and marketing specialist at Lendio. Passionate about entrepreneurship, small businesses, and inbound marketing. Mike shows his passion by sharing stories of successful entrepreneurs and companies with small business owners on the Lendio blog. He makes these big success stories easy-to-apply in simple and easy to read language for the everyday small business owner and entrepreneur.